Washington Capitals left winger Chandler Stephenson poses with a young fan and the Stanley Cup during a visit to Humboldt, Sask., on Aug. 24, 2018. A small Saskatchewan city devastated by a fatal bus crash involving its junior hockey team welcomed a trophy Friday that fans no doubt hoped would one day be hoisted by one of their boys. 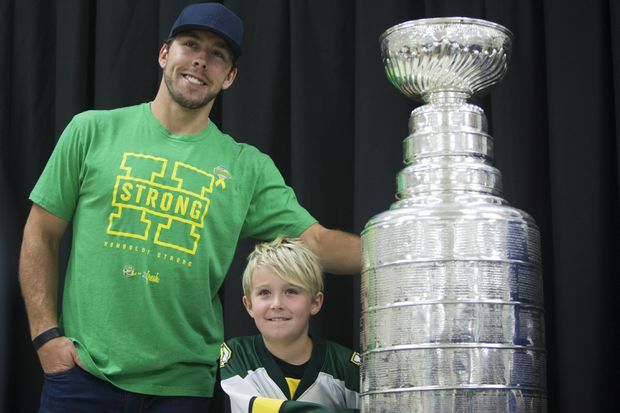 Chandler Stephenson, a forward with the National Hockey League champion Washington Capitals, brought the Stanley Cup to Humboldt to recognize the community’s strength and resilience after the April crash that killed 16 people — 10 of them players. But a quiet visit to the rural highway crossing where the Broncos team bus and a transport truck collided may have meant the most. “While their Stanley Cup dreams went unfulfilled, we thought we’d bring Stanley to them,” read Mr. Pritchard’s tweet. “That means so much to me,” said Kaleb Dahlgren, one of the 13 players who survived. “I know those people that lost their lives there would really appreciate that. I appreciate it, too. Some of the survivors met privately with Mr. Stephenson before the Cup was introduced to the public. “It’s tough ... listening to some of the parents,” he said afterwards. “It’s tough to talk to them [to] ... give your condolences. Mr. Stephenson, originally from Saskatoon and wearing a green “Humboldt Strong” T-shirt, was escorted by the RCMP as he carried the Cup into Humboldt’s Elgar Petersen Arena. More than 3,500 people played a selection of different games and activities and there was a giant blowup Broncos jersey on display outside the rink. Mr. Stephenson was joined by more than a dozen current and former professional players for Humboldt Hockey Day. It was organized by the NHL and the NHL Players’ Association to celebrate the city of 6,000. Two of Mr. Stephenson’s friends — Mr. Dahlgren and Brayden Camrud — were among the survivors. Mr. Dahlgren said he heard from Mr. Stephenson soon after Washington beat the Vegas Golden Knights last spring to win the Cup for the first time. “So to be here now and have this celebration and help Humboldt heal is something special,” Mr. Dahlgren said. “That’s really nice of Chandler and everybody that’s coming out from the NHL. Chris Joseph, whose son Jaxon died, said that being back at the rink was difficult, but he’s happy the Broncos are moving forward. Training camp for the 2018-19 season is this weekend. Ethan Vanallen, a 14-year-old from Tisdale, Sask., wore a Broncos jersey and said that it was nice to see all the support. The Broncos were on their way to a Saskatchewan Junior Hockey League playoff game in Tisdale when the crash occurred April 6. The RCMP have said they will not release any details of the investigation or what they believe happened. The only thing the Mounties have said to this point is that the truck was in the intersection when the collision occurred.